Can you have a negative length? Preliminary confidential to the KMS middle schoolers who asked this question: I am continually impressed by your active minds; it was a delight to meet you and be your teacher for a day recently. And you should be very grateful for the teacher you get to have every day. Ms. O cares deeply about you, about keeping your minds active and about your success. Thank her for that now and again in 10 years when you realize the impact she has had on your lives. Back to the question: Technically, no. “Length” is always positive. As is “Area”. As is “Speed”. But if you are willing to expand your mind and imagine a world with negative lengths, you don’t cause any problems. But you will have to be ready to consider negative areas. And negative speeds. In Physics, they deal with this by the difference between speed and velocity. Velocity can be negative, as it includes direction. Forward velocity is positive; backward velocity is negative. Speed is the absolute value of velocity. Whether my velocity is 10 mph or -10 mph; whether I am running forward or backward, my speed is 10 mph (positive). And this requires a negative version of distance. In Physics, this is displacement. Displacements can be positive or negative. Distance is the absolute value of displacement. In Calculus, it can be useful to imagine a world in which area (and length) can be negative. It’s not usually encouraged, but it causes no problems and in fact can make some concepts more intuitive. How can negative areas and lengths be intuitive? Well, you’re an eighth grader and you thought of them-shouldn’t a college student be able to also? Is it still a triangular prism when it sits on a rectangular side? A prism is a 3d figure and each is named after its base. Below is a triangular prism. 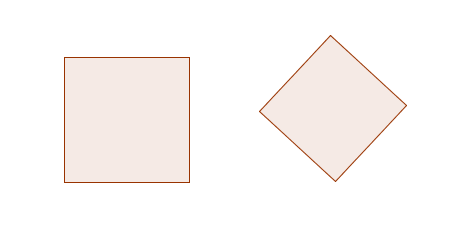 If you rotate it so that the rectangular face is on the bottom, as below, why is it still called a triangular prism if technically its base is no longer a triangle? This is a really important question. In geometry it is essential to think of figures by their geometric properties. Where these figures are and what direction they are facing are not geometric properties. In the everyday world, we often get these confused. Think of a baseball diamond. We call it a “diamond” because it sits on its corner. But in geometry that doesn’t matter. A baseball “diamond” is really a square; it has four sides all the same length and it has right angles. That’s what it takes to be a square in geometry-it doesn’t matter what direction the sides are running, nor where the square is. So your triangular prism is a triangular prism no matter what direction it is pointing. And the triangular bases are still called the “bases” of the prism even when the prism isn’t sitting on them. A better way to talk about a triangular prism would be that it can be placed on a triangular base-not that is has to be resting on a triangular base already. By the way, the rectangle-as-base orientation of a triangular prism suggests another formula for volume. If we put two of these prisms together (as below), we get a solid whose volume is (Area of rectangular base) x (height of prism). So the volume of a triangular prism is half of that: (1/2) x (Area of rectangular base) x (height of prism). Questions from middle schoolers V: Where do mathematicians come from? Were mathematicians chosen by god? Do we “discover” or “invent” mathematics? That is, does mathematics exist in the universe, like the Sun does, and we discover it? Or is it something that never would have existed without us, like automobiles, and we invent it? If you think it’s discovered, you are called a “Platonist,” after the Greek philosopher. If you think it’s invented, you might be a “formalist”. Either way, it’s a lovely debate to have with yourself. Careful…it might keep you awake at night.